Creating a How To Guide seemed daunting, but Chris Butts’s guide mentioned the word recipe, so that become my organizational structure. Since this will be public and sharable, I thought I’d create a more generic image of my family. So I searched for apps that would allow me to draw on my images. I found Paint X Lite [free] for my Mac. It worked like a charm: I quickly added the smiley faces and hair to each family face. Blend two families together carefully with humor and story to build a foundation for grandkids. Add in several dollops of home so wherever we are, we are family. Sprinkle frequently with piles of pleasant calm. Pour in a gallon of wonder daily. A generous tablespoon of geek tenders the wonder into creative ideas and solutions for the five liters of learner added next. Fold in a ton of teacher to inspire, along with the kilo of kindness to spread to those around us. Spread out over the years and enjoy a lifetime of loving memories. Next, I chose images for each ingredient, plus a couple extra. I decided to share via Google Presentation, making the Preparation text an interactive set of links to the images and annotations for each step. I then wrote this post so others could see my process and product. Others can make a copy of this presentation to use as a template for their own, so it’s remixable! Remember, you can click the “settings gear” to “File” → “Make A Copy” to use this as a template for your own How to Be Me Guide. Have fun! Thank you for learning How To Be Sheri Edwards. What do you think of this take on a “How To Guide”? 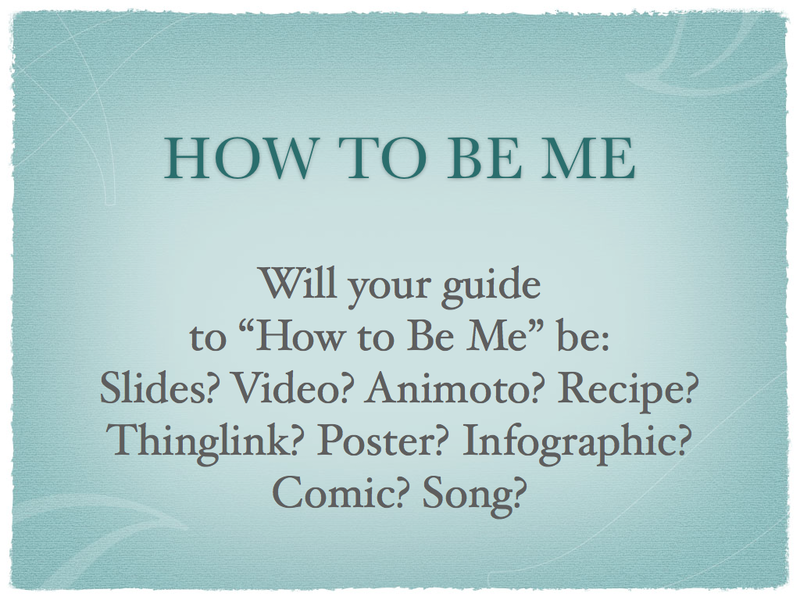 What will strategy will you use to create your How To Be Me Guide? Thanks, Patricia. It was fun to choose what to include. Nicely done, and a great example to share in the Make Bank. Kevin, I imagine this will be the only time I’ll be caught up in #clmooc. Monday begins the sweet chaos. Thanks for your support.